I was searching online to find an alternative to expensive healthcare grade TVs for a budget-minded client. I came across Paradigm Multimedia's website and contacted them by email. I received a call from the owner, Reinhold Baron, shortly thereafter. He answered all my questions about their product and even gave me some tips on what TVs to purchase. I purchased 25 of the kits, and, I must say, my client was blown away! They got better TVs at a much lower price! Don't be afraid to try Paradigm. You will be glad you did. This product is amazing! It is a much cheaper and a much easier solution next to buying expensive healthcare grade TV's for patient rooms! This is a great product and it cuts down cost of expensive TVs. I am very impressed by the product. 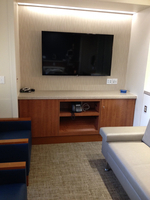 When we were approached by Lankenau Hospital in Wynnewood, PA to provide a 60" Large Screen Healthcare Grade Television for multiple VIP patient rooms, we were stumped. We then contacted Reinhold Baron and Imagenable for assistance in solving this customer need. After a few email correspondences, we were able to provide Lankenau Hospital a 60" LG television with healthcare capabilities by using the Paradigm Multimedia HC20. The installation of the product was plug and play which made installation quick and easy. The administrators at Lankenau are extremely happy and we would like to thank Paradigm Multimedia for providing us with a solution to help us accomplish this goal. The pillow speaker kit's are performing flawlessly . I have recieved no complaints during or after the installation . The feedback from our facilities is all positive. The savings from the kit installation has allowed us to expand our television upgrade project to the next level. We were a bit skeptical at first as to how Paradigm's technology could save our customer money in purchasing TVs for their patient rooms and allow us to make a reasonable margin. The owner of Paradigm Multimedia, Reinhold Baron, made a good argument for us to try it so we did. Our customer loved it. What he really loved was the fact that he could purchase a larger TV for his rooms and still pay less than a healthcare TV. From our standpoint, the units were simple to install. And when we did come across an issue, it was quickly resolved over the phone with no time lost in the installation process. Thanks to Paradigm we now have a viable option to expensive hospital grade T.V's.